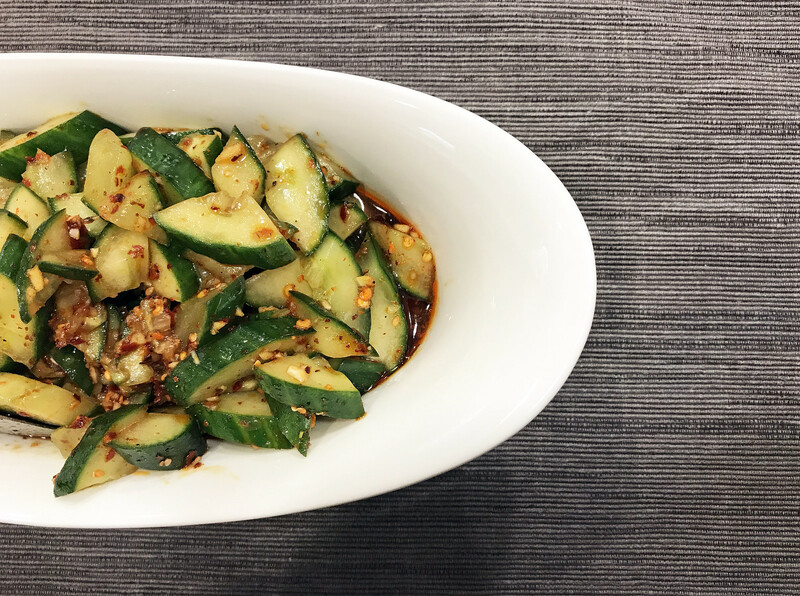 There’s this cucumber appetizer at Z&Y Restaurant in San Francisco’s Chinatown that I love: piquant, garlicy, and salty, it’s perfect in its simplicity yet a challenge to recreate. Until now. This is as close as I’m going to get to achieving this cooling cucumber that’s perfect alongside a meal of spicy dishes. Resist the urge to make smacked jokes: the smacking refers to whacking the cucumber to help it absorb the flavors of the sauce. Try not to crush it into a million pieces! 1. Lay the cucumber on a chopping board and smack it a few times with a rolling pin. Cut the cucumber lengthwise into 4 pieces. Cut the cucumber on the diagonal into 1-inch slices. Place in a bowl with the salt, mix and set aside for 15 minutes. 2. Combine the remaining ingredients in a small bowl. 3. Drain the cucumber, pour over the sauce, stir, and serve.